Well, my friends, National Novel Writing Month (or NaNoWriMo) is complete. I'm proud that I managed to finish all 50,000 words (and then some! ), and now I need a little dance break and some reflection. Firstly, I'd like to say that writing 50,000 words in a month while still working a full time job was not as easy as I had thought perhaps it would be. Secondly, I have no idea what I was thinking when I decided to illustrate every post. That was just silliness. However, I did think it would make the sheer volume of the text seem a little more manageable. Now, I must explain something for those of my readers who've never participated in NaNoWriMo. It's not actually a contest. It's more like…when people run the New York Marathon and they get a medal. It's more about the fact that you reached your goal than it is a competition. 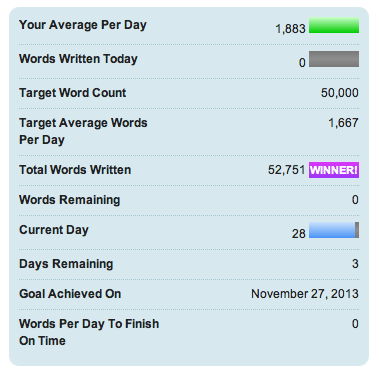 That being said, I need to share my little stats module from the NaNoWriMo website. Check it out below. Also, while I was writing and Illustrating A Fashion Story, I finished watching all of Law and Order. I'm kind of sad, but now I've moved on to Law and Order: Criminal Intent. In conclusion, thank you so much for reading A Fashion Story while I tried to meet this crazy goal. It was super fun to know you were reading, and I hope you'll stick around! I'll be switching gears for a little while and having a few more gift guides. If you want to see the ones I made before NaNoWriMo started, click the "gift guides" tab at the top of The Spinsterhood Diaries website. Oh, and stay tuned in the New Year! You never know what kinds of spinsterly adventures I may be getting myself into.